At TaMolly's, we make each and every dish with love, from our kitchen to your table. That's why we use only the highest quality all-natural chicken, beef that's marinated 24 hours, the freshest produce and real sour cream. You'll also love our prices. TaMolly's offers great value without sacrificing the freshness and flavor you crave. No one else gives you better taste, at a better price. Take advantage of our fresh daily specials or order off of our extensive, southwestern-inspired menu. 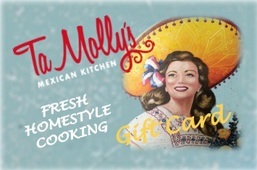 At TaMolly's, we want you to fall in love with the most savory, authentic Tex-Mex cuisine this side of the border. We love our food, and we know you will too. Come in to your nearest location today and experience the quality, freshness and value for yourself.